Faceted moldavites in combination with red garnets or zirkons and silver. Small red garnets are other typical gems from the Czech Republic. The combination with moldavites have been popular since 19th century. In the past in was quite popular in combination with fresh water pearls (from Czech rivers). October 27, 2018 in Jewelry. Can you imagine the feeling from wearing of the fascinating necklace? April 7, 2016 in Jewelry. How to make various moldavite jewelry? 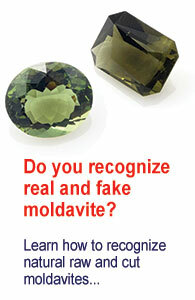 Are you interested in making a jewelry with moldavite – a pendant, necklace or perhaps earrings? November 30, 2015 in Jewelry. Robin showed me her necklace made from moldavite and leather string. August 25, 2015 in Jewelry.